Fully loaded with 20 innovative features, this Hitachi RAW222KVD 2 Ton Window AC is a great cooling solution for you this summer. It comes with Auto Climate Technology (ACT) which recognizes temperature and humidity in your city, and adjusts the temperature and fan speed with a simple touch of a button in order to provide you a perfect cooling experience. Capacity: This air conditioner has 21019 BTU/ Hr cooling capacity. 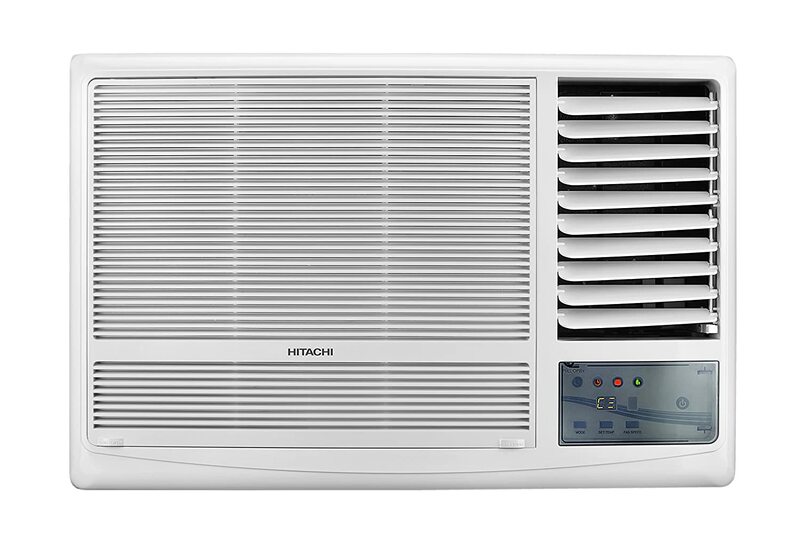 Design: The compact and stylish Hitachi RAW222KVD 2 Ton Window AC has 660 × 430 × 755(W × H × D) mm dimensions and 64 kg weight. It has pre-coated aluminum fin which prevents the AC from corrosion even in the harshest weather. Air Filters: The dust filter in the AC traps any unwanted dust particles, allergens and bacteria present in the air. Speed of Cooling: This AC has a powerful mode in which the fan speed is super high that cools down your room quickly. In high humidity conditions, you can switch to dry mode which helps in removing moisture and creates a comfortable environment. Sleep Mode and Timer: With the On/ Off timer function, you can set the AC to switch On and Off the cooling operation as per your need. The sleep mode function helps you maintain a perfect cool and cozy ambience so that you can enjoy a good sleep along with saving electricity. Noise Level: This Hitachi RAW222KVD 2 Ton Window AC has 52 dB indoor noise level. Other Specs: It has an auto power-saver mode which selects a comfortable temperature and maintains the temperature at about 25? C with suitable fan speed. With its wireless LCD remote control, you can manage the settings with simple press of a button from the comfort of your bed. The other features include auto fan speed, kaimin function, filter clean indicator, and eco-friendly refrigerant. This air conditioner comes with 1-year warranty. Energy ratings: The Hitachi RAW222KVD 2 Ton Window AC comes with a BEE 2 star energy rating.